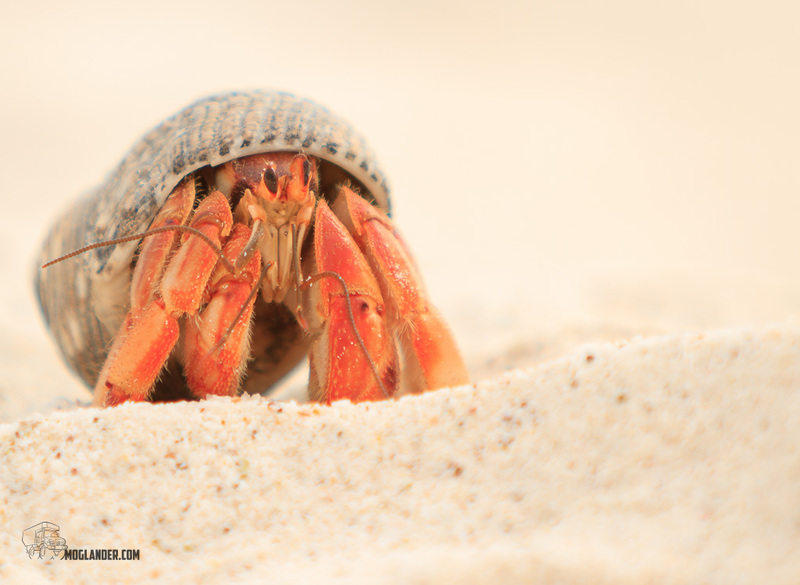 It was time for us to take another mini holiday from our truck (or should I say fact finding and exploratory mission) and so the Galapagos Islands off the coast of Ecuador was our destination. It is always sad leaving our truck, but more importantly we had to find a secure place to park it for 3 weeks, in the hope that all would be okay when we return. We left the truck in Lima in Peru in Miraflores, and thanks to Alberto from http://www.rvperu.com/ for finding us a secure spot, and fingers crossed it will be fine when we get back. 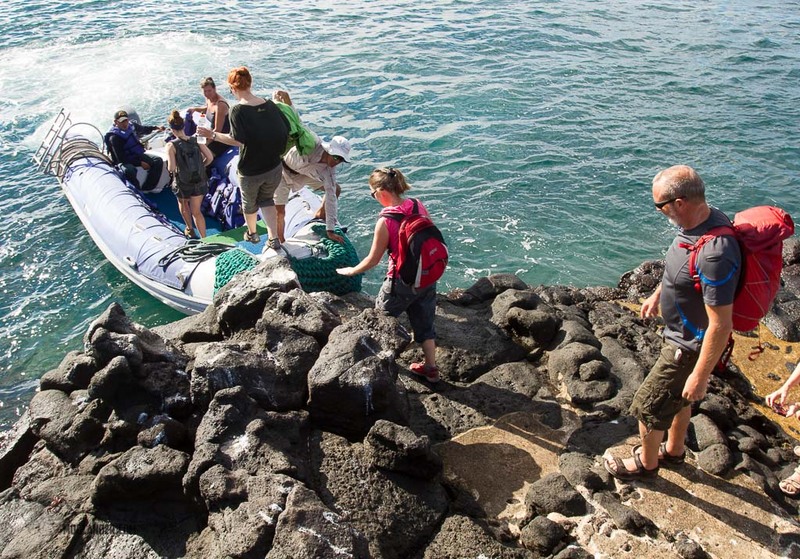 Obviously the only way to get to the Galapagos was by plane. Okay, Merv did not like the idea of taking a flight as he boasts that in the last two years he has been on 4 different continents and no flights, quite an achievement really but then I guess he already has a pretty big carbon foot print! 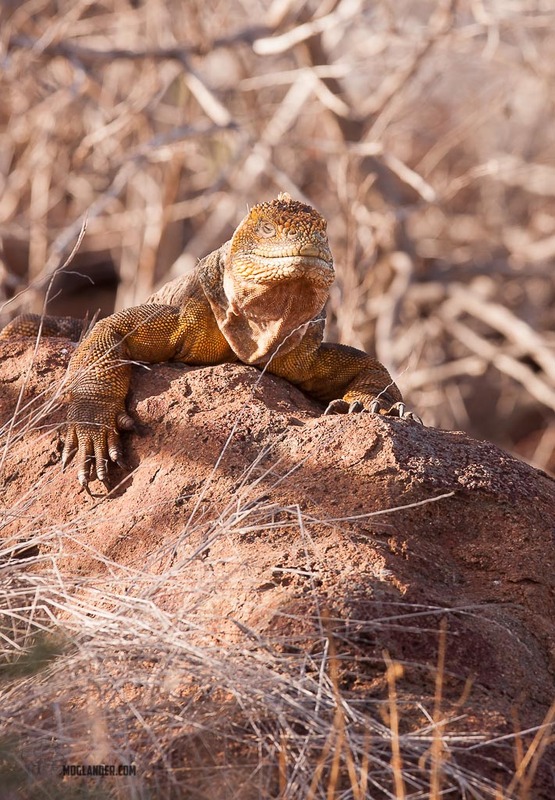 The Galapagos aren’t typical tropical paradises like you might see in the Carribeen, most of the islands have no vegetation or at most some mangroves and cactus, but many of the creatures that call these islands their homes are found nowhere else in the world. That really is the magic of these islands. 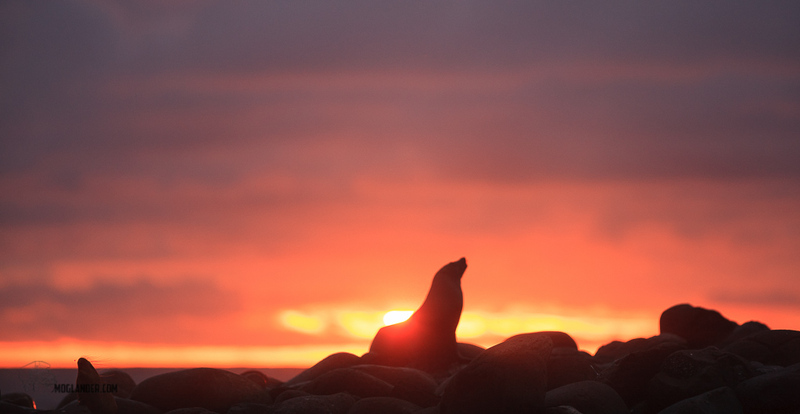 The beaches are small, mostly with soft white sand, and usually you have to share them with the many sea-lions that occupy them. After all it is their home and we are the intruders!. Humans do live here but only on five of the islands, there are over 125 islands in total, with a population of about 25,000 people. The islands lie in the Pacific Ocean on the equator, 90 degrees of Greenwich. They are 1000km from the mainland in an area of 7880 sq km of land and over 50,000sq km of ocean. 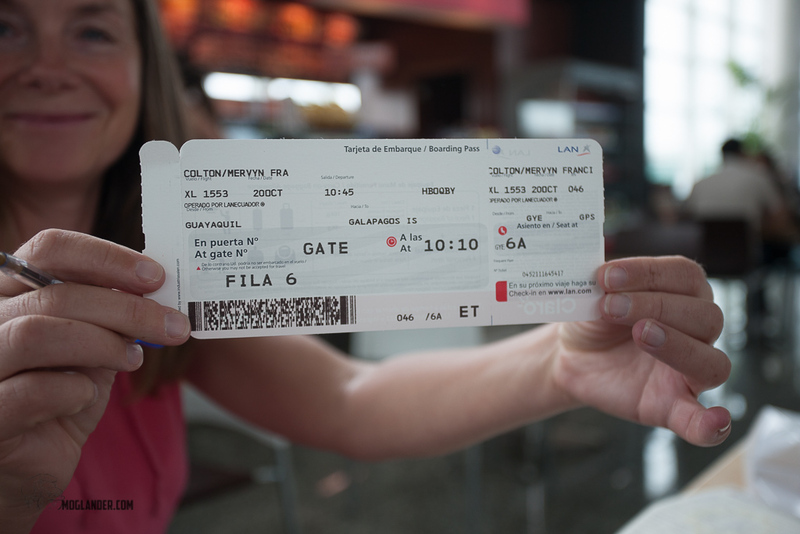 The Galapagos National Park fee is US100 and this must be paid in cash at the airport when you arrive, also a transit control fee of US10. The currency used is the US Dollar just like the rest of Ecuador. Two of the islands have airports, Santa Cruz and Santa Cristobal (the capital), so we flew into Santa Cruz and back to the mainland from Santa Cristobal. You can island hop from one to another no problem, it just involves taking a water taxi for about 2 hours or so at high speed over very bumpy water and don’t think about it. We did this many times as we visited different islands, so soon it was like second nature to us! I don’t think. Most of these water taxis have 3 200hp engines, and seem to go on the basis that time is money! It costs $30 to go from one of the inhabited islands to another, so it’s not too bad, but you take a hell of a beating if the sea is rough. We had been told that the morning crossings were smoother, but we found ourselves that there was no real difference in what time you took the taxi, it’s all rough. Merv finally has to fly somewhere. At least it was worth it. Well we arrived finally to the island of Santa Cruz . Just to give you an idea of our mode of transport to get there. On the morning we were leaving we drove our truck to secure parking, then taxi to bus station (where incidentally we met a neighbour of ours from Kill village,small world), 30 hour bus journey to Guayaquil in Ecuador, mind you we were in the VIP seats, so no complaints whatsoever, first class on an aeroplane eat your heart out. Taxi to our hotel as we had to do an overnight, taxi to the airport, plane to Baltra aiport (on a tiny Island beside Santra Cruz Island),bus to the dock, boat to Santa Cruz and last but not least a bus to Puerto Ayora which is the main town on Santa Cruz we needed to go to. A lot of transport hopping but finally we had arrived and it was made all the more sweet by seeing Jurgen and Ruth waiting for us when we got off the bus, big smiles and hugs all round. We had last parted company in March, and had a lot to catch up on. As they had arrived a few days before us , they had all the research done on the best ‘last minute’ cruise for the four of us to do, which was 8 days/7 nights aboard an allegedly first class boat. As we had not seen them for nearly 7 months it was off for Caipirinha’s , followed by lobster and stories about how the road was treating us and our trucks, I think more importantly the trucks were the topic of conversation, not to mention the great places and wonderful things we had seen along the way. 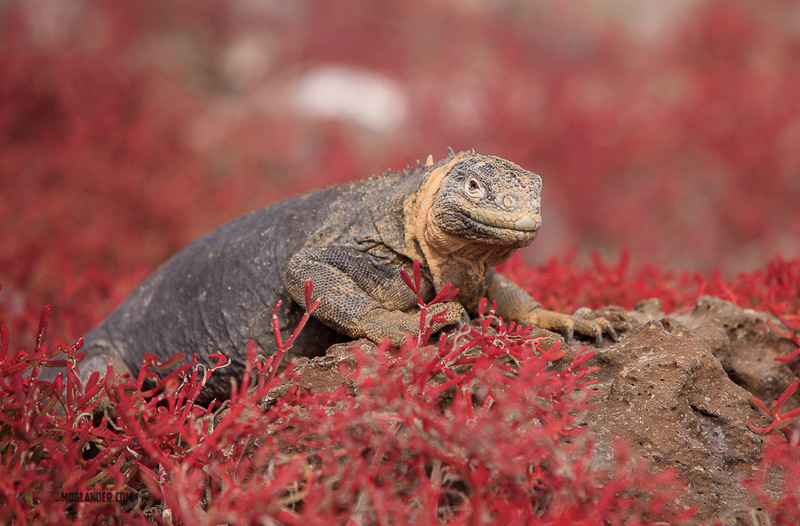 Basically once you are on the Galapagos (and you MUST fly via Ecuador) there are 2 ways to see the Galapagos, by sea on a Cruise or by land. We did a little of each, but the cruise was better for getting to see a greater variety of sights and wildlife. At this time of the year (November) you can go to the islands, and then look around for a cruise and pick one up within a few days, a week at the most. 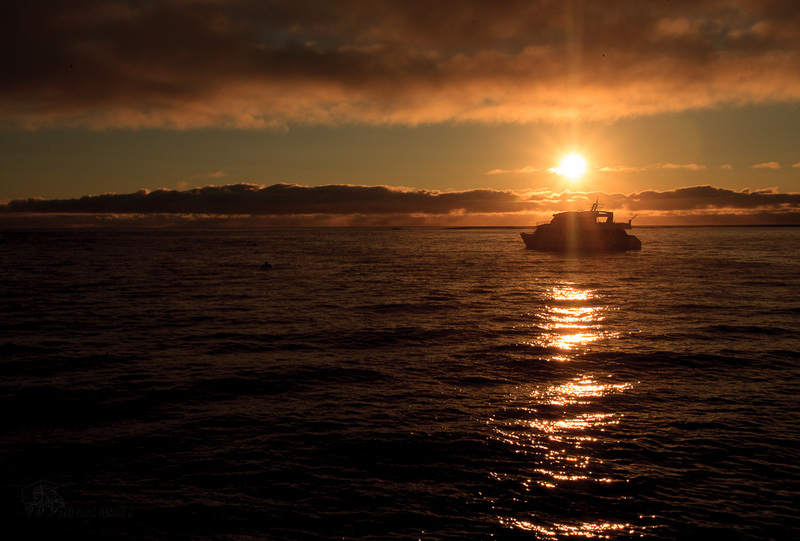 It’s low season, and the boats do not seem to get booked up until days before departure. Most cruises seemed to start on a Monday. 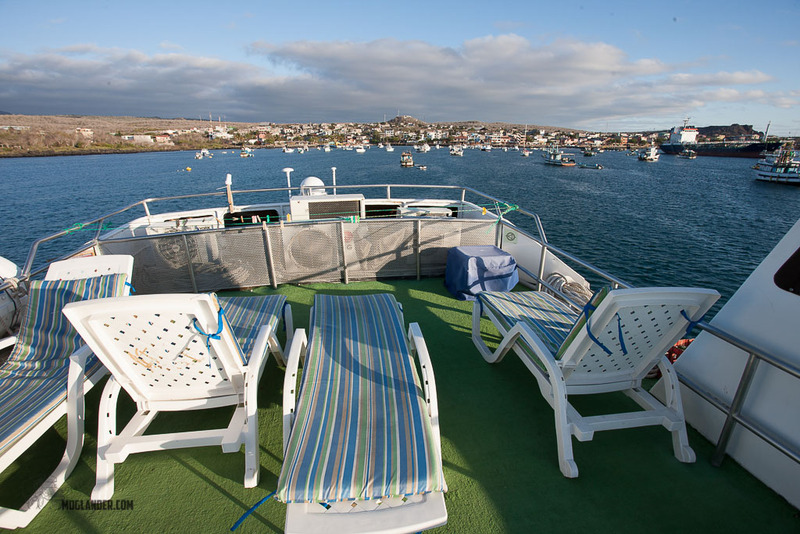 We met Enrique our tour guide when we boarded our tour boat Estrella de Mar, he showed us to our cabins which were small but clean with private bathroom, two bunk beds and a place to store your clothes in drawers under the bed. As we were on the top deck we also had a window, great for the view and the breeze. The thing that defines a first class boat is that you have a private room, with private bathroom – well worth it. Some people were on the lower deck, so only a tiny window that could not open, so they were a bit stuffy. There were only 16 passengers on the boat so a lovely number for when we went to land and see the sights, everybody was able to keep up with the guide as we were all young and fit , plus it was easy to get to know everybody quickly and share travel tips ! The crew consisted of 8 people and once all the passengers were on board (some were coming from other islands or airport) it was all systems sailing. We had a few stops around Santa Cristobal Island one being Punta Pitt which is the north eastern most point of the island. 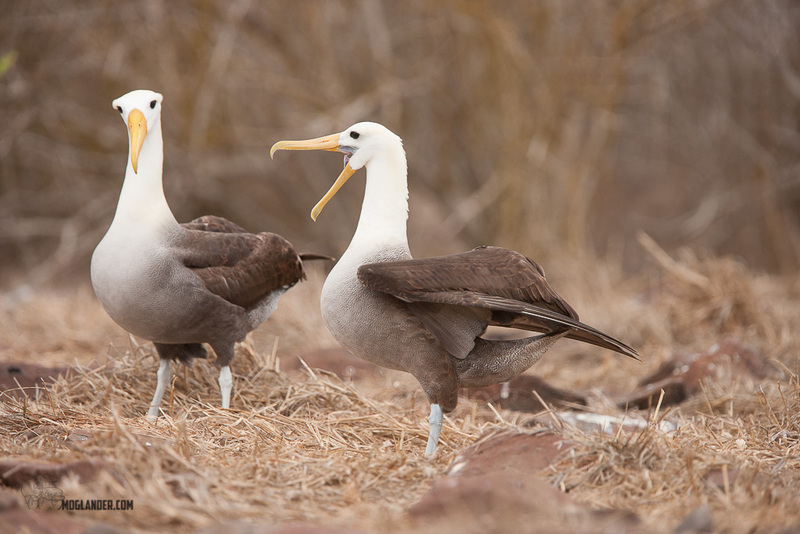 Here we saw the Galapagos booby species , the blue-footed, red-footed and masked booby. This is the only place we would see all 3 types of these birds in the one place. These birds sometimes leave here in search of food into the sea, so it was fun to watch them as they nose dived into the water when they would spot a fish or two. Volcanic tuff formations and lava cones were also unique in their own right here. Cerro Brujo was our afternoon stop and here we were met with a beautiful coral sand beach which was occupied by many sea-lions. 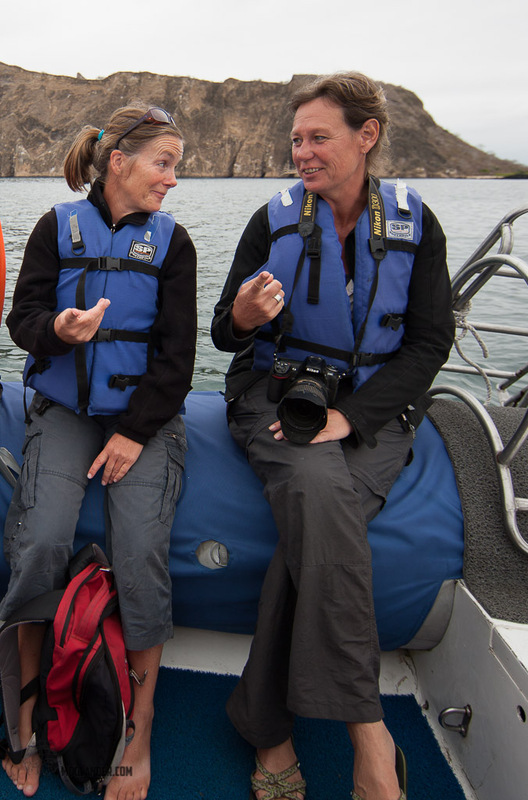 Here also was our first opportunity for snorkelling, so it was on with the wet-suits to see what we could see. Our guide Enrique explaining how the layers of the island were built up. 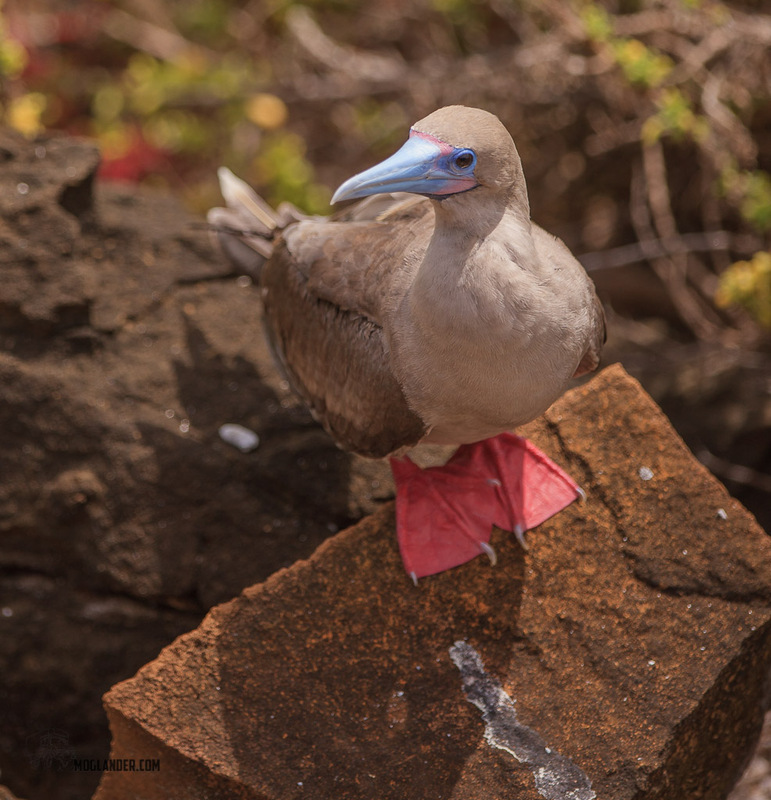 Red footed boobie. Same blue beak as the blue footed but can be clearly identified as different due to the glint in it’s eye. As we always sailed at night, especially when we had a long distance to travel,seven or eight hours between some islands, this meant that during the day we didn’t have to move too far, usually. could buy that on board, or bring your own, which we did ! The weather was mixed, usually a cloudy start followed by a couple of hours sun, but it was never cold. All of us would have liked a lot more sun, because when the sun shone you could really see how clear the water was, so many different colours of blue, it was truly a wonderful sight to see. It was just unimaginable how clear the water could be. The crew consisted of 8 people, all were lovely. Our cabins were cleaned every day, also our towels were changed at least 3 times over the course of the 8 days, and were always folded into a shape of one of the marine animals living on the Galapagos, very clever and a nice touch. There were no locks on any of the cabin doors, so there was a feeling of trust among everybody on board. The passengers were from many corners of the world, Ireland , England, Germany, France, Poland, Australia , The United States of America and Canada, all lovely. 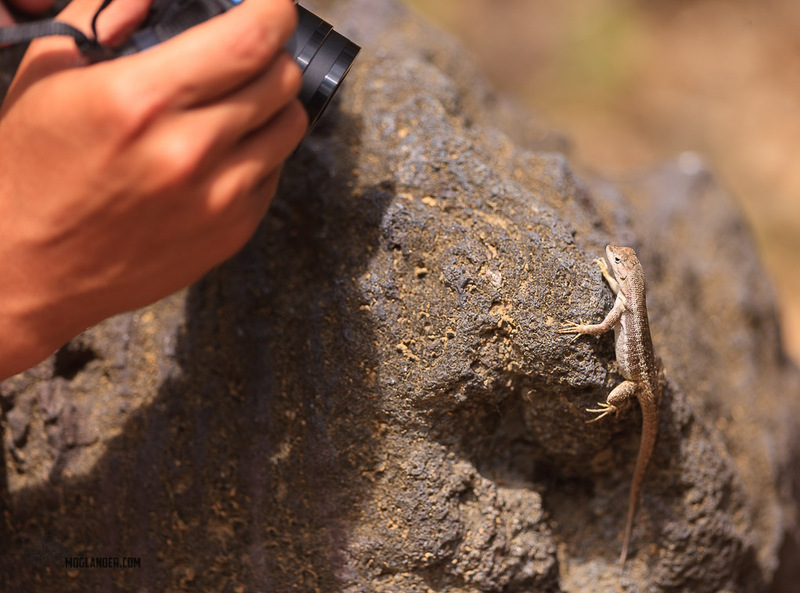 Some were on long-term travel, others shorter, and some even very short like 2 weeks ! 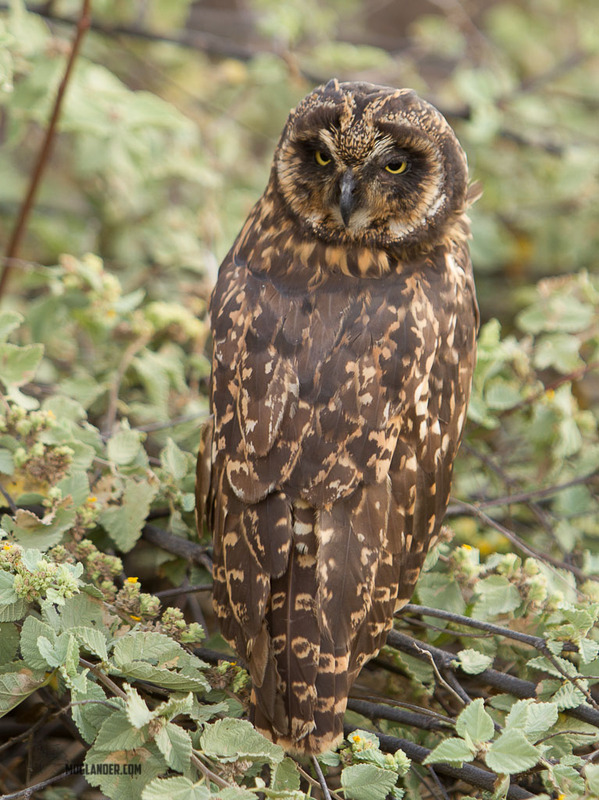 Short Eared owl. There is one island with no Hawks, and that is the only island that the Owls stay out during the day. Sarah and Ruth pointing to the boss. Oh yeah. lion. It consists of a rock that emerges from the sea, eroded in half and in between these rocks there is a channel where you can snorkel and dive. As we were on a small boat we were able to sail between them, pretty cool place. After sailing through the night for about 7 hours , the next morning we had arrived at the beautiful island of Espanola. This island is not only one of the most beautiful but also the most southerly. 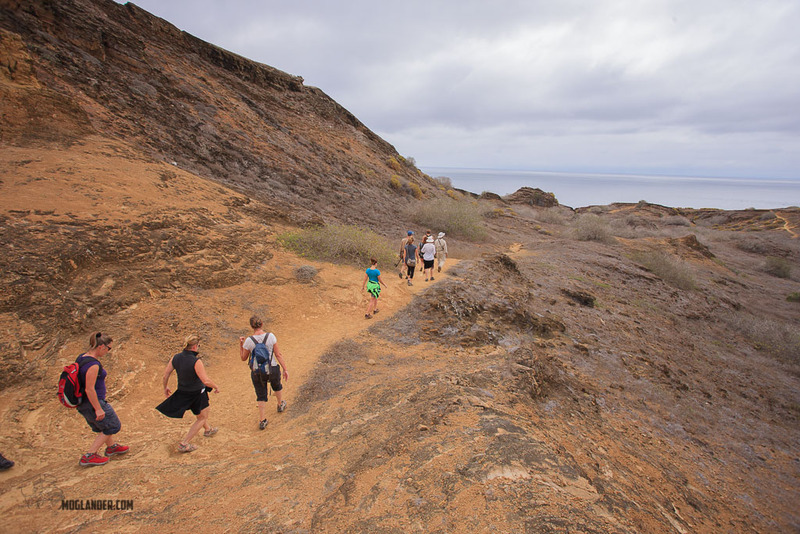 We walked along a rocky trail taking us through masked and blue-footed booby colonies. The beach was full of marine iguanas mainly the red and black but we did mange to see the odd multi-coloured one, red , green and black. Probably the most spectacular event of the day was seeing the waved albatross colony. Late March to early December is when much of the world’s albatross population comes here to breed, so our timing was perfect. Even at a few months old, these birds are spectacular (can’t believe I have just typed that, me not being a bird lover) with their long curved yellow beaks, fluffy molting hair as their parents perform their mating call to identify their mates. There were many breathtaking views from the wave battered cliffs below us and you could see many blow holes in the rocky shore below as water shot high into the air. Many sea-birds take off and land from these cliffs, some very clumsily I might add. This island also has a big sea-lion population , many new babies are born here, and we were just a few minutes late for a new arrival, pity. 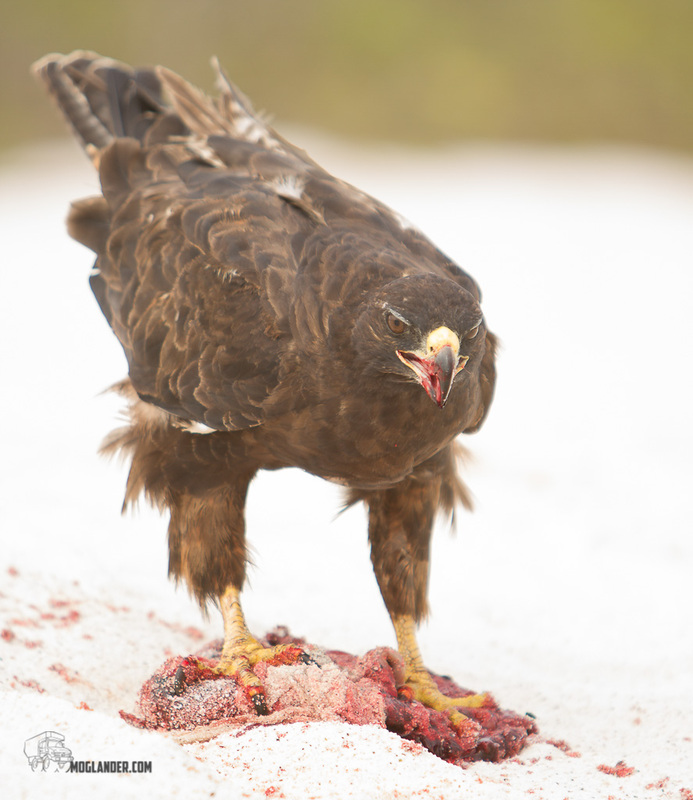 We could tell this as the placenta was still on the ground being hovered up by the nasty Galagagos hawk, not to pleasant to watch. 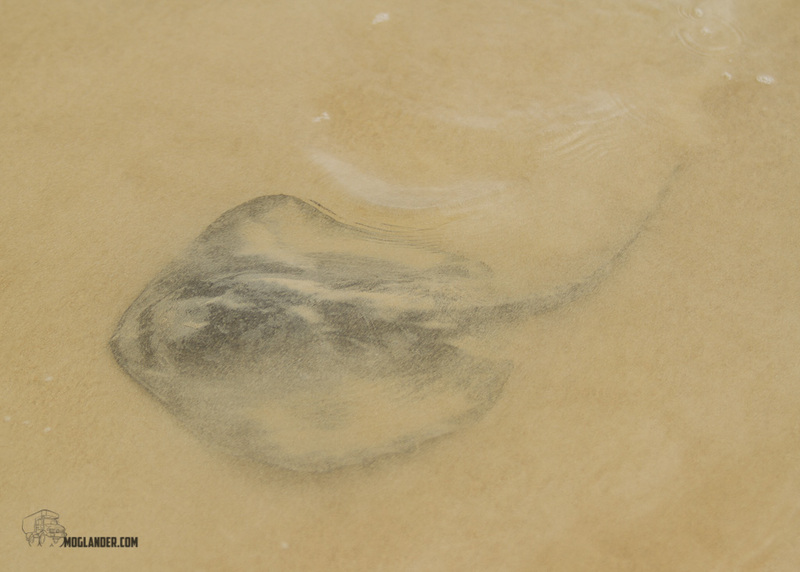 Stingrays hover in the shallows to evade the sharks. spent two years living there, growing vegetables and trading them for rum with other boats. The story goes that he remained drunk for most of his days , then stole a boat and set sail to the mainland with five slaves, but only Watkins reached the mainland, the luck of the Irish I guess ! 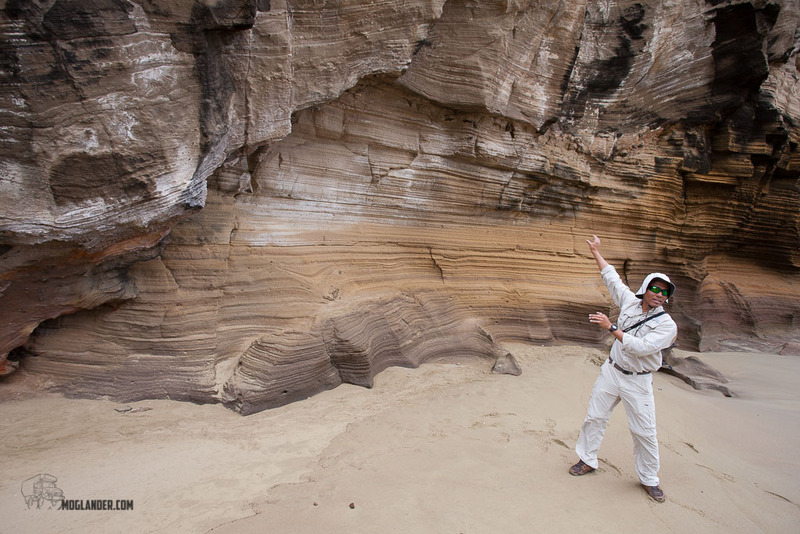 Here we visited Punta Cormorant by a wet landing, a greenish beach in colour due to the mineral olivine in the water. After a short trail we ended up at another sandy white beach, it wasn’t recommended for swimming due to the many sting-rays in the water. They were so close to the water’s edge you could almost touch them, really visible, but it was a lovely beach to walk along on such a sunny morning. Devil’s Crown was a semicircle of rocks popping up out of the ocean, but had a very strong current. Most people went snorkeling here and saw many coral formations, swam with some sea-lions, turtles and some others managed to spot a shark in the distance. After our lunch it was off to the Post Office, yes, Bahia De Los Correos (Post Office Bay) . Some of this post office has been moved to a museum, but this is the real deal. This Post Office is still functioning even though it only has two wooden barrels which by now are pretty rotten, but never the less it serves a purpose. It used to be used by the American and British whalers . These days tourists leave postcards hoping that they will find their way like message in a bottle. Also tourists are asked to look through a bunch of cards and if you find one for your home country you must deliver in person to the person named on it. I was getting a bit deflated so many cards, none for Ireland, but then I found two, so I guess two lucky people in Ireland will have me knocking on their door sometime in the future with their cards from the Galapagos. I hope I get a cup of tea at least. I also left two postcards there for 2 special people, so hopefully some day in the future you will get a knock on your door , it might be quite some time, or maybe not. You might get them even before I return . All administration duties completed we descended into a lava cave with the aid of steps, rope and a torch. Once underground the path was slippery and we had to slosh around in some chilly water, but a very cool place for a swim, cool being the operative word. The islands of Seymour and Bartolome were our next ports of call. Seymour had probably the largest and most active seabird breeding colony on its island. All the islands had their own ‘unique’ thing and on this island it was our first time to see the Frigate Birds. It was quite a sight to see their big red inflated red breasts as they flew high above the coastal cliffs. 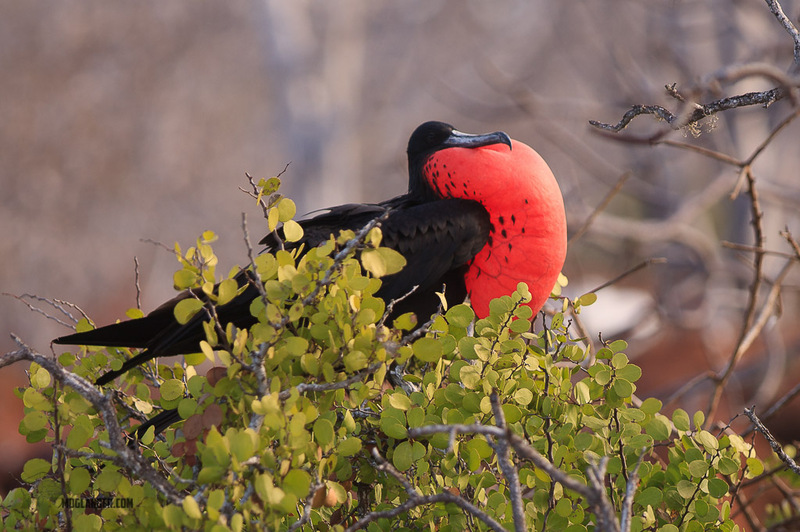 Sometimes they would annoy smaller birds, getting them to drop their catch into the water and the Frigate bird would swoop in for dinner, saved them having to hunt. As we were on this island by 6.15 am the light was perfect so all camera men were happy. 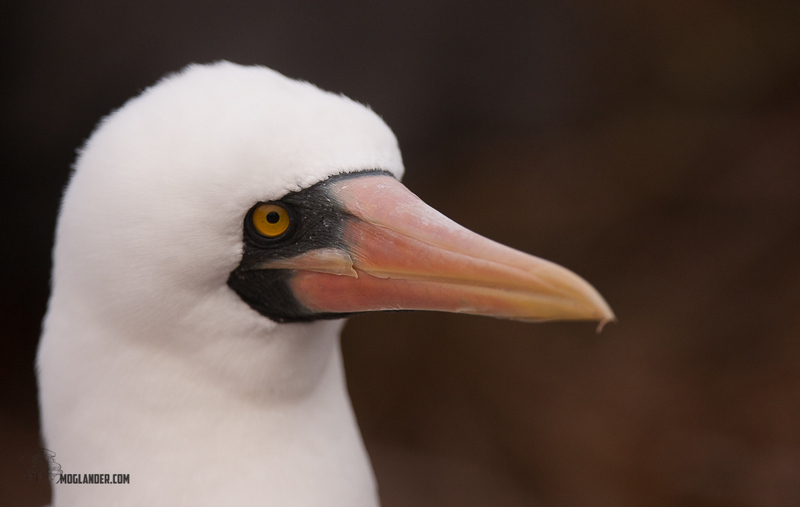 We were able to get very close to the Frigate bird nests and even saw some chicks. A lovely beach too with the water protected by rocks, splashing up some big waves against them. Bartolome on the other hand had panoramic views as well as a nice beach. On the beach we saw one female marine turtle and three males swimming close to the shore keeping an eye on her. The males were waiting for the female, enough said, yes they had their way and then they were on their way. Also we saw three white tipped sharks swimming close to the shore, a huge bonus as nobody had to get wet to experience any of this. We walked up many steps to a lighthouse , along a wooden boardwalk and the reason why is to protect the trail from erosion. Great views from the top, also many lava formations as we looked down and around us . It was on this island that the movie Master and Commander was filmed, the island was hired out for a period of time at huge expense. We saw many Galapagos penguins on the rocks as we took a panga (Zodiac or rib) ride before heading back to our boat for dinner, and we got within a few meters of them. 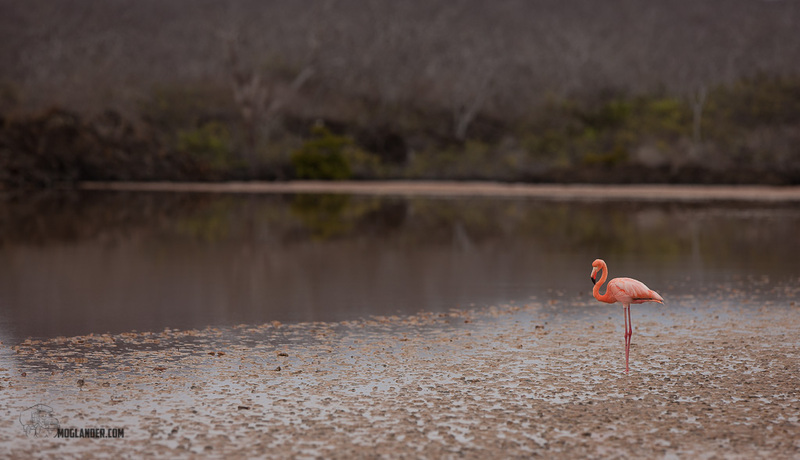 We did not expect to see flamingos here. Nice surprise! Santa Fe Islands were our next stop to see some of the tallest cacti on the islands, some over 10 metre high, and also to see the land iguanas that survive by eating this cacti. The water was very clear here so we could see turtles swimming on the surface. Sea-lions here too, they were everywhere, but one in particular seemed to be in a lot of pain, moaning a lot and Enrique said she was about to give birth. It was apparently her first birth so could take quite some time. He knew this by the amount of noise she was making, normally if its their second, third or whatever it is less painful and happens very quickly. We did a panga ride here too and saw many dolphins swimming basically all around us , superb! 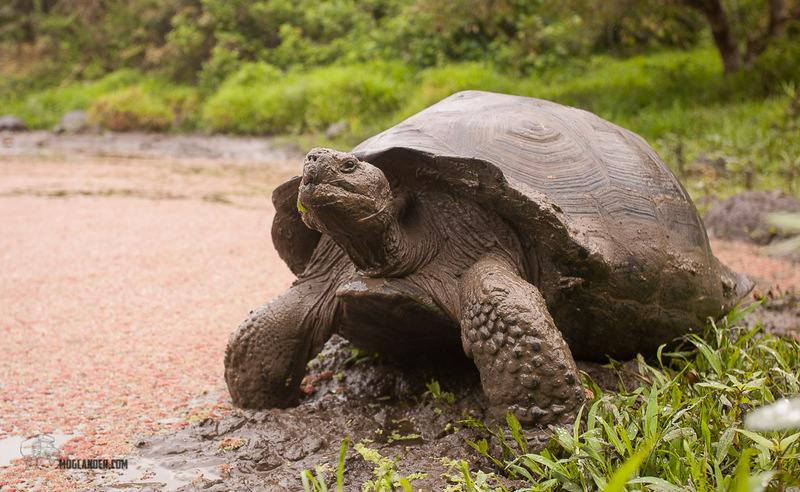 This is a Juvenile giant tortoise, only about 50 or 60 years old. He could hit over 400kg fully grown. El Chato Tortoise Reserve was our last port of call. 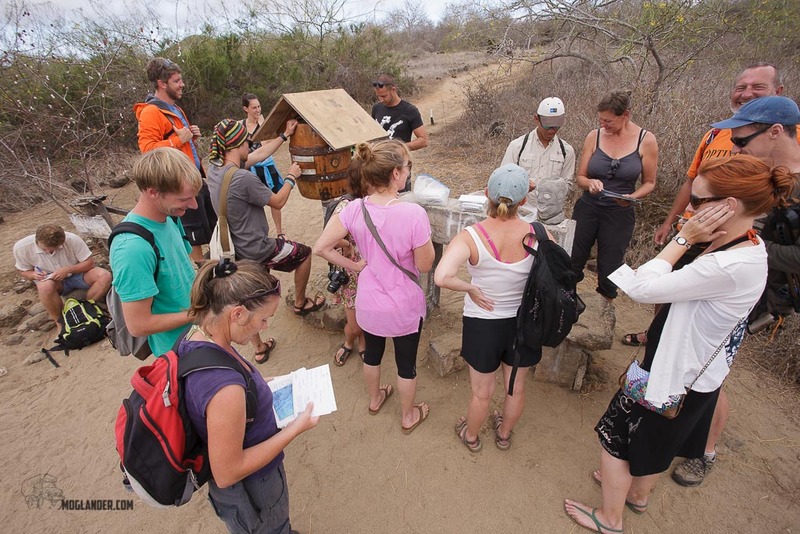 Here we could observe giant tortoises in the wild. When they extended their accordion like necks to feed it was an impressive sight, but what was more impressive was to see them living naturally in the long grass on this reserve. Also it had ponds which were full of natural nutrients for them to feed. They may move slowly, but their hearing is excellent so even if you are trying to sneek by they will hear and give you a look as much as to say ‘get off of my reserve’, its only for the old like us! Well with our cruise over we stayed some more days, visiting again some more places on Santa Cruz. For example on Santa Cruz we went to Las Grietas which was a water filled crevice in the rocks, and many fearless people climb the vertical walls that were at least 10 metres high and dive into the water below. Some more graceful than others, but never the less they do it. Tortuga Bay was another lovely beach we were able to walk to, and as well as surfers here you could see sharks , pelicans and marine iguanas. We also did more island hopping and went to Isabella Island as we didn’t visit it on our cruise. As boats arrived from the other islands, hoteliers would stand at the pier offering accommodation so there was always a banter before we said yes, and of course a good price. As we were there in the off peak season it was a lot more easy to bargain, but generally 10 to 15 US Dollars was the going rate per person. 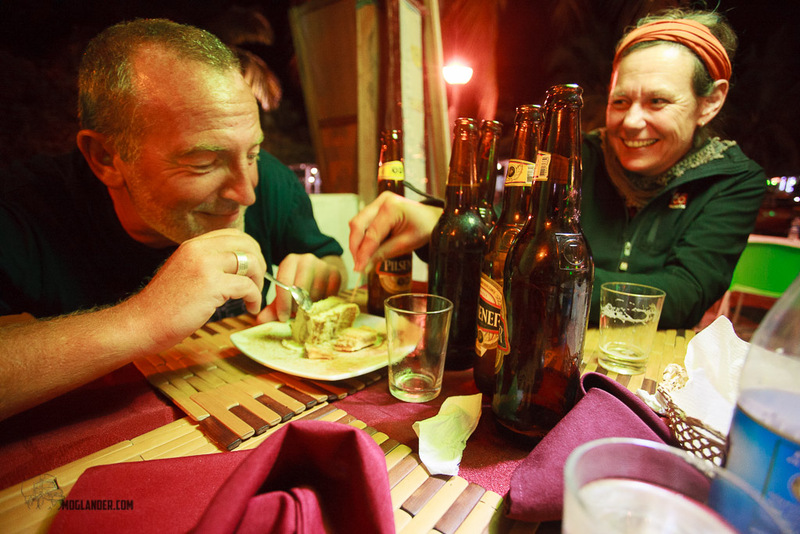 We also tried to get a hostal with a kitchen so we could cook for ourselves. On the larger island of Santa Cruz it was more like 20US Dollars per person, but that was for a hotel with a sea view. (we had a lovely place on Santa Cruz, thanks Jurgen and Ruth) Of course you could pay anything up to 300 Dollars per night, and even more! Also for food you could eat as cheaply or as expensive as you wished. Also on Sundays on Santa Cruz they closed one street from traffic and set up tables and chairs down along and at about 7pm the restaurants on both sides opened and it was all a buzz of atmosphere for the evening, lobster being the main dish of the day as we managed to be there for Lobster season. Fantastic idea. Santa Isabella was so tranquil, it was like we had stepped back in time. We stayed in a lovely hostal here called Cerro Azul (fellow travelers I strongly recommend this place). Nelton the owner was lovely, so helpful, friendly and nothing was a problem. He would also organize tours if you wished. Lovely clean place with own kitchen,just as well as the choice of restaurants was limited, and the price a bit ott. Also there were hammocks in the garden to relax, which was great for us to absorb everything we had seen and done over the last few days. A bit of a whirlwind really. 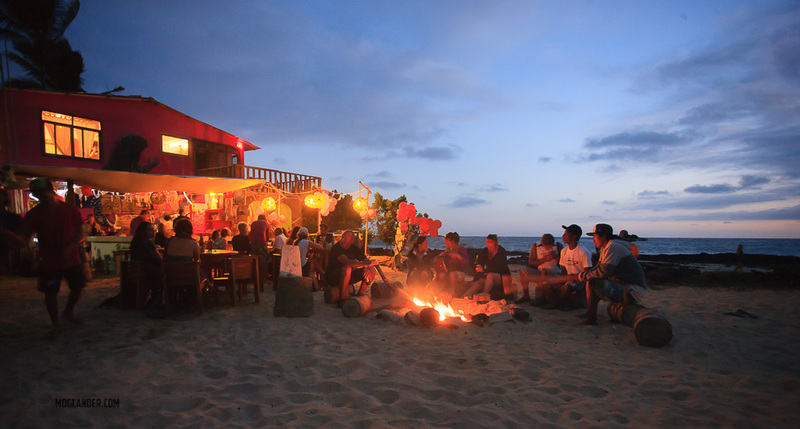 Most of the evening entertainment started at Happy Hour in the Caleta Iguana Hotel and Surf Camp from 5 – 7 pm. It had a beach front bar, hammocks, live music and each evening once it was dark they lit a bon-fire in the sand, pretty amazing to sit around and drink our two for one! 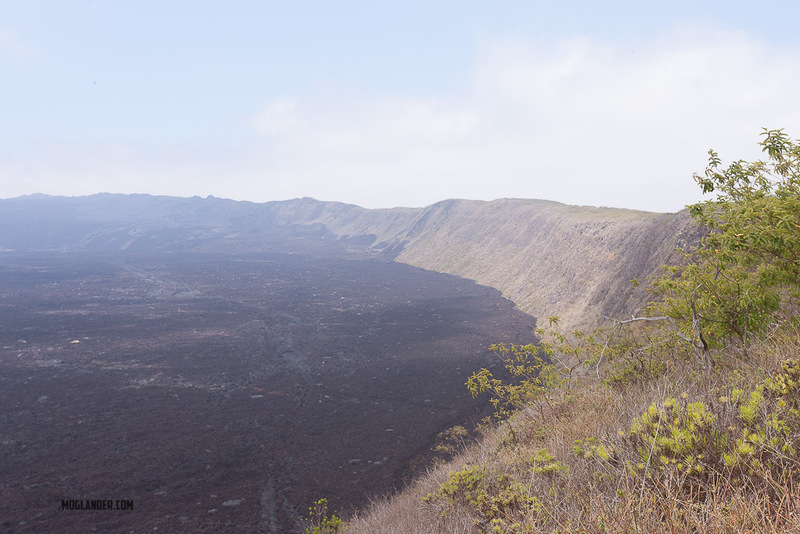 Many volcanoes are still active here, the last one erupting in 2005 (Sierra Negra). 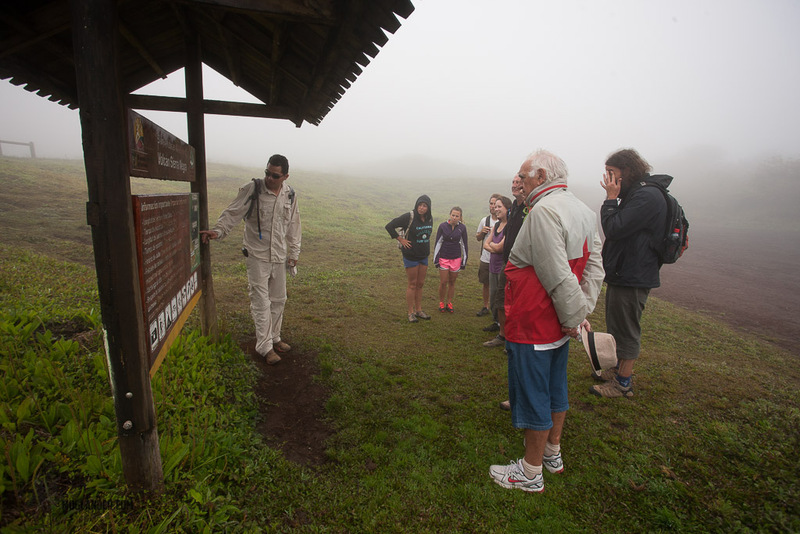 We hiked (16km round trip) to Volcan Chico. 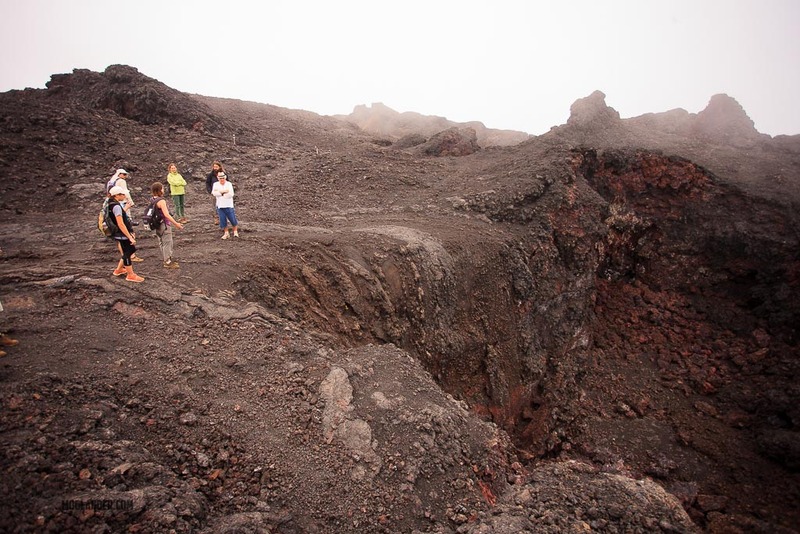 It was a little damp and foggy on the way up so we didn’t see too much, but once we got to the top we could see the subcrater and some fumaroles. On the way back we managed to see some of Volcan Sierra Negra which was fairly impressive, but due to the weather conditions it didn’t rock my boat. Sadly the weather got worse so it was a quick high tail back to the end of the trail. Another day we walked (round trip 10km) to the Wall of Tears. This 100m long wall of lava rocks was built by convicts under harsh and abusive conditions. 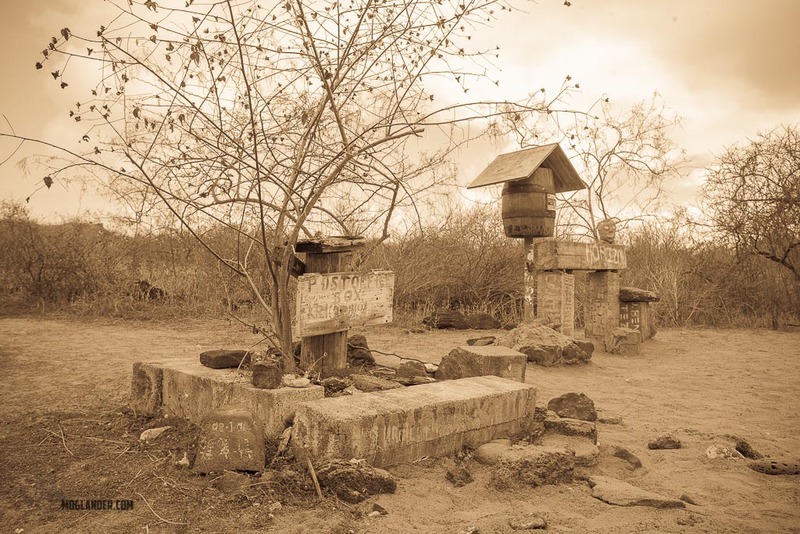 This penal colony closed in 1959 but still stands as an infamous part of the islands history. he had died and gone to heaven. Mind you I had to take over the remote from him as the Tennis end of year Finals from London was on live each morning while having my breakfast, so yes I was in charge of it for a change. There is a lot of construction work happening on this island, as the big cruise ships are no longer allowed to stop at The Galapagos, so now everybody must fly in so more accommodation is required for the tourists. Not sure that this is a good thing, but I guess the islanders need the money. There were a small few restaurants to choose from here, all keenly priced . On the evening before we left we went to the local San Cristobals got Talent, where school kids dressed up and acted out as John Travoltas and Oliva-Newton John’s Grease Lightening, what a sight to see! This was followed by a local folklore group, about 10 guys in total, playing flutes, recorders, guitars, churangas, violins singing as they played. They were really good. The area was a flush with locals all enjoying the music, while their kids played tig with each other, jumping over the sea-lions as they slept on the street and benches. Another lovely atmosphere with such simple fun. 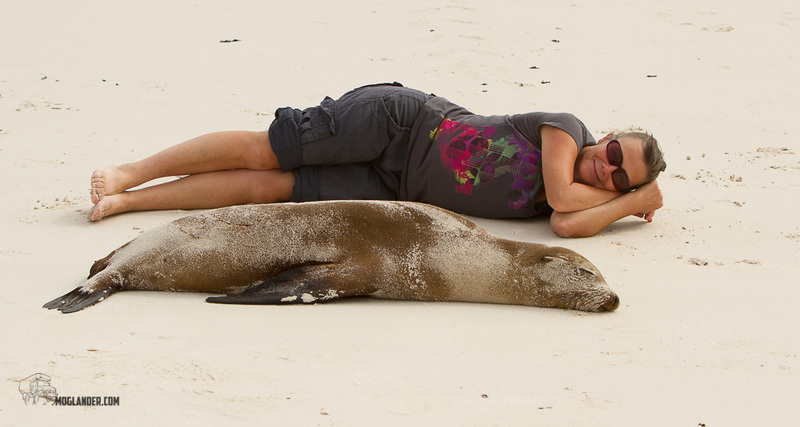 Well that about sums up our trip to The Galapagos. Its name may have changed,( it used to be called The Enchanted Isles), but it still remains a pretty unique place to visit. Merv and I both feel very privileged to have been able to visit here (another hole in our budget), but you only live once. I hope it always remains natural and never becomes too populated with humans. Jurgen and Ruth it was really great to spend the time with you guys, so looking forward already to our next ‘last minute trip’! !